As we’re gearing up for the launch of NICER, we wanted to give our readers a behind-the-scenes look at the mission, its science, and the people who are making it happen. NICER is NASA’s first mission designed specifically for the study of neutron stars, so we are kicking things off with an interview with an expert on these unusual objects! 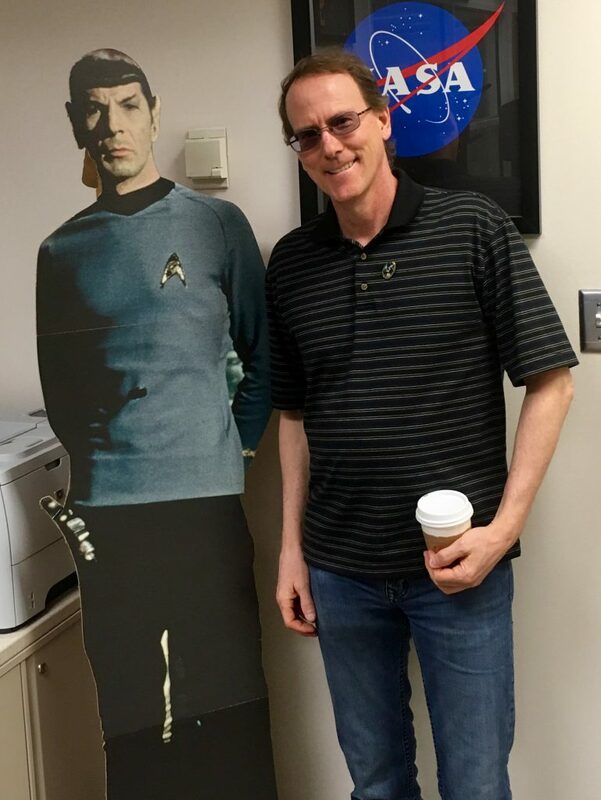 Here’s a five-question interview with Dr. Tod Strohmayer, an astrophysicist here in NASA Goddard’s Astrophysics Science Division. Q: What’s the focus of your work? Can you tell us a little about what you’re currently doing? And how does your work relate to NICER-SEXTANT? A: I am an astrophysicist whose research is primarily focused on studying the compact stars that are formed when a normal star’s life comes to an end. Stars like our Sun will end their lives as white dwarfs, which are about the size of Earth. More massive stars, say 8 – 10 times heavier than the Sun, will explode as a supernova, and leave behind a neutron star, about the size of a large city. Stars even heavier than this will also explode, but they will leave behind a black hole, which is smaller still. Because such stars are massive but small (compact), they have very strong gravity, which makes them powerful sources of high energy radiation, like X-rays and gamma-rays. We use telescopes placed in orbit, above Earth’s absorbing atmosphere, to study the high energy radiation from these stars to learn about them. They are exciting to study because of their extreme nature. They have the highest matter densities, the strongest magnetic fields, and the most powerful gravitational fields that we know of in the universe. By studying them we can “crash test” our physical understanding of how the universe works, pushing our theories to the limit. A key question that NICER will address, and one which I am also actively working on, has to do with how big neutron stars are? Their size is set by how “squishy” matter is at these extreme densities, something that is still unknown. By measuring the size of several neutron stars accurately, we can quantify this “squishiness,” something physicists call the Equation of State of dense matter. We will make this measurement by accurately modeling the X-ray emission from the surface of a neutron star and comparing what we observe with NICER to our model predictions. Part of my current work is developing these models with NICER’s team of scientists. 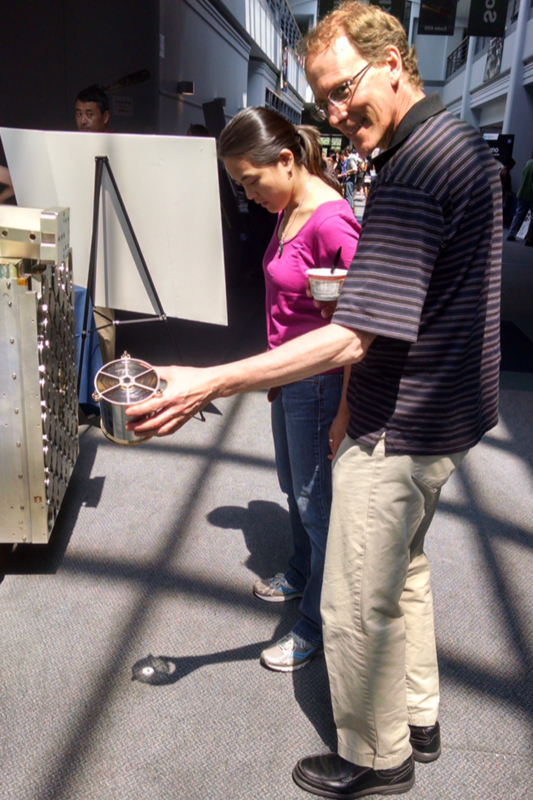 Dr. Tod Strohmayer shows off one of NICER’s X-ray concentrators at an event at NASA Goddard. Q: How did you get interested in astronomy and science? A: I was interested in science from an early age. I think it was a combination of watching and reading about NASA’s moon missions as I was growing up, as well as enjoying Star Trek on TV! I had a small telescope when I was growing up and that also furthered my interest in astronomy and outer space. In high school I got exposed to some physics for the first time and kind of enjoyed it. When I went to college my initial thinking was to study to be a medical doctor, however, I wasn’t keen on dissecting frogs, so I switched into physics. After deciding to attend graduate school I combined my interest in physics with astronomy and decided to do my research for my graduate degree in astrophysics. The extreme aspects of neutron stars seemed exciting, so I did my graduate work studying aspects of neutron stars, specifically, how they oscillate and vibrate. Q: What is one thing about your job that might surprise people? A: Maybe some people think that science is “boring,” just sitting in front of a computer terminal? While there is some of that, there is also a lot of team work and problem solving, and there is always a new challenge to be undertaken and wrestled with, which keeps it exciting and fresh. I find the exploration aspects of my job very exciting. There is the chance to work on new data and instruments that no one has ever used before. It’s really possible to find new things that no one has ever seen before! Tod poses with one of his early space science inspirations. Q: What’s the next big thing in astrophysics that you’re excited about? We’re assuming you are excited about NICER-SEXTANT, of course, but what’s next after that? A: Yes, I’m very excited about NICER! Also, there are new observing capabilities in the X-ray band that will be coming available in the next few years. One of these is X-ray polarimetry which is still largely an unexplored field, because it’s difficult to measure the polarization of X-rays. Like polarized sunglasses, one way to think about X-ray polarimetry is that it cuts through the glare and lets you see certain things more clearly. A mission called IXPE was recently selected by NASA for development and eventual flight, and I’m still very interested to see the new X-ray polarimetry data. A: I enjoy staying active. When I was young my favorite sports activity was to play hockey. I still enjoy skating, both on ice and inline skates. In fact, if you’re at Goddard Space Flight Center after 5pm on a sunny Spring or Summer day you might find me skating around the Center’s roads! I also enjoy soccer and play in the Goddard recreational soccer league. Another thing I like to do outside of work is play the guitar. For more about neutron stars – and how weird they are – check out this Tumblr post!